The General Secretary of the ruling NPP, Mr. John Boadu has revealed that members of a vigilante group affiliated to the party once saved his life. He said although the party does not support political vigilantism, there have been instances where such groups have saved the lives of individuals from thugs from other political parties. Speaking about the rise of political vigilantism, Mr. Boadu told the Emile Short Commission, recounted how he was once saved from an irate group of armed men led by Mr. Collins Dauda’s brother known as Naaba Abdulai at the Asunafo North constituency during a monitoring exercise by an NPP aligned vigilante group. According to him, the men vowed to beat him up, and he had no option than to take cover with the ‘boys’ who escorted him since the policemen were also helpless and running to take cover. He said the police at the area at that time was helpless. He admitted that groups such as Kandahar boys, Bolga bulldogs, invincible forces and Delta forces are all aligned to the NPP. 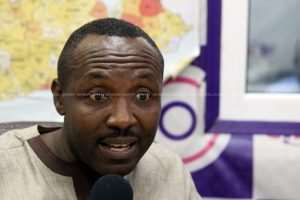 Mr. John Boadu also condemned the violence at the Ayawaso West Wuogon by-election. He also maintained that the violence recorded at the La Bawaleshie polling station although very unfortunate does not discredit the outcome of the by-election in any way as the briefings from he had the NPP polling agents revealed that the violence escalated away from the voting centre. Today’s sitting saw Security Analyst Dr. Kwasi Anning, and Detective Inspector Sulemana Abudulai Jallo of the East Legon Police Command make appearances to give their testimony of the commission. Mr. John Boadu’s appearance before the commission makes him the first NPP official to testify before the commission.